We connect our artists to a larger audience by featuring work in limited edition print issues, our website and social media platforms. Artists selected by the guest juror will receive a 2-page spread including a brief bio, website, and 2 images in print and digital formats. 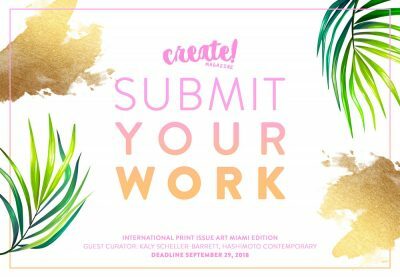 Published artists will receive a complimentary digital issue and will be listed with images, details and information on our website/social media for life. All featured artists will automatically be considered for any upcoming curatorial projects and exhibitions organized by our team. Create! Magazine is a bimonthly digital and print independent publication for artists, designers and creative entrepreneurs. Our issues have been featured at Art Miami Fairs, Apartment Therapy, Stack Magazines, Study Breaks, Secrets of Green, and more.